TRAILER: Disney’s ‘Alexander’ Out On DMA & Blu-Ray February 10th! Disney’s heartwarming comedy that will have your entire family laughing out loud, Alexander and the Terrible, Horrible, No Good, Very Bad Day arrives on Digital HD, Blu-ray Combo Pack, Disney Movies Anywhere and On-Demand February 10th! The film stars Steve Carell (Crazy, Stupid, Love, TV’s The Office) as Ben Cooper, Jennifer Garner (Dallas Buyer’s Club, TV’s Alias) as Kelly Cooper and Ed Oxenbould (Paper Planes) as Alexander Cooper. The home entertainment release is also packed with hilarious bonus features. 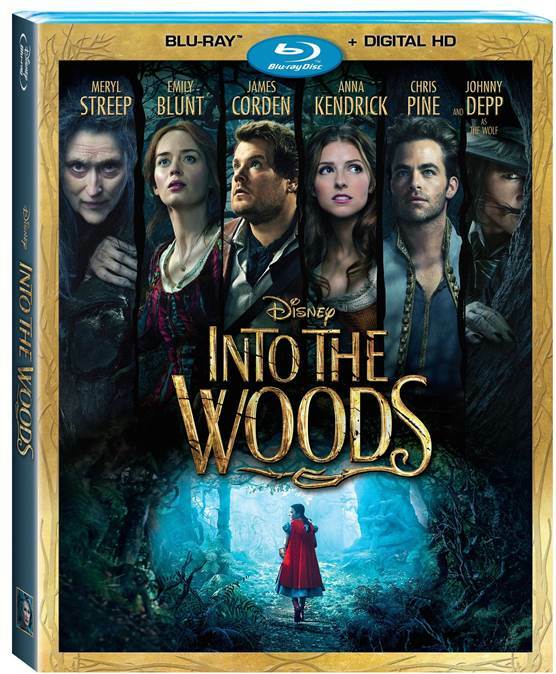 Check out the Blu-ray trailer for the film below! The Boxtrolls Nominated For 13 Annie Awards — Details Here!! Heroes come in all shapes and sizes in the family event movie The Boxtrolls. Starring, in voice performance, Academy Award winner Ben Kingsley, Isaac Hempstead Wright (Game of Thrones), and Elle Fanning (Maleficent), the new movie from animation studio LAIKA, the makers of the Academy Award®-nominated Coraline and ParaNorman, comes to Blu-ray™ 3D and Blu-ray™ Combo Pack including Blu-ray, DVD & DIGITAL HD with UltraViolet on January 20, 2015 from Universal Pictures Home Entertainment. The Boxtrolls will also be available on Digital HD December 23, 2014, just in time for the holidays! The Boxtrolls have also just been nominated for 13 Annie Awards. Nominations include: Best Animated Feature, Outstanding Achievement in Directing in an Animated Feature Production (Anthony Stacchi and Graham Annable), Outstanding Achievement in Writing an Animated Feature Production (Irena Brignull, Adam Pava), Outstanding Achievement in Voice Acting in an Animated Feature Production (Ben Kingsley; Dee Bradley Baker), Outstanding Achievement in Character Animation in a Feature Production (Travis Knight; Malcolm Lamont; Jason Stalman), Outstanding Achievement in Animated Effects in an Animated Feature Production (Rick Sevy, Peter Vickery, Kent Estep, Peter Stuart, Ralph Procida); Outstanding Achievement in Character Design in an Animated Feature Production (Mike Smith); Outstanding Achievement in Production Design in an Animated Feature Production (Paul Lasaine, Tom McClure, August Hall); and Outstanding Achievement in Storyboarding in a Feature Production (Julian Narino; Emanuela Cozzi). The film has also received a Satellite Award nomination for Best Animated or Mixed Media Picture. Best of luck to them with all their nominations, be sure to check out the new box art above and stay on the lookout for the movie! 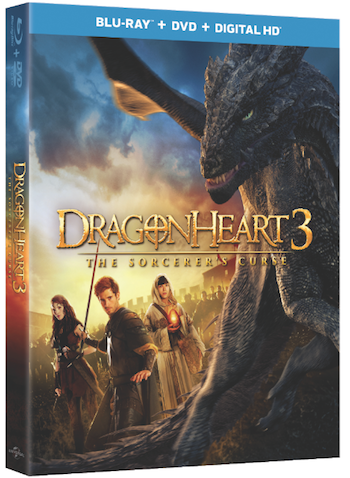 TRAILER: ‘Dragonheart 3: The Sorcerer’s Curse’ On Blu-Ray/DVD February 24th! Fans will embark on an all new adventure featuring Ben Kingsley as the voice of Drago the Dragon in Dragonheart 3: The Sorcerer’s Curse, debuting on Digital HD on February 10, 2015, and on Blu-ray™ Combo Pack with Blu-ray™, DVD and Digital HD with Ultraviolet™ and on DVD on February 24, 2015 from Universal Pictures Home Entertainment. Renowned producer Raffaella De Laurentiis returns with a brand-new installment of the legendary fantasy franchise that has delighted audiences worldwide. Packed with non-stop excitement and mind-blowing special effects, the Blu-ray and DVD showcase a special behind-the-scenes featurette taking fans deeper into the thrilling journey. In Dragonheart 3: The Sorcerer’s Curse aspiring knight Gareth goes in search of a fallen comet rumored to contain gold and is shocked to instead find the dragon Drago. After Drago saves Gareth’s life the two become intricately bonded, and must work together to defeat an evil sorcerer and stop his reign of terror. Along the way, Gareth learns the true meaning of being a knight in this action adventure for the ages! • Blu-ray™ unleashes the power of your HDTV and is the best way to watch movies at home, featuring 6X the picture resolution of DVD and theater-quality surround sound. 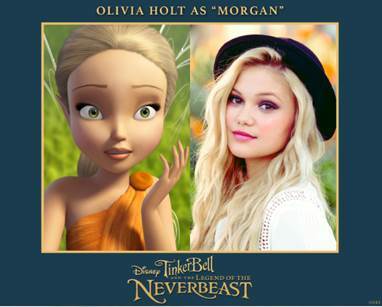 Check out the trailer for this adventurous movie below! TRAILER: ‘The Boxtrolls’ On DVD & Blu-Ray January 20th! Heroes come in all shapes and sizes in the family event movie The Boxtrolls. Starring, in voice performance, Academy Award winner Ben Kingsley, Isaac Hempstead Wright (Game of Thrones), and Elle Fanning (Maleficent), the new movie from animation studio LAIKA, the makers of the Academy Award®-nominated Coraline and ParaNorman, comes to Blu-ray™ 3D and Blu-ray™ Combo Pack including Blu-ray, DVD & DIGITAL HD with UltraViolet on January 20, 2015 from Universal Pictures Home Entertainment. The Boxtrolls will also be available on Digital HD December 23, 2014, just in time for the holidays. Based upon the book Here Be Monsters!, The Boxtrolls voice cast also includes Academy Award® nominee Toni Collette, Jared Harris (Mad Men), Nick Frost (The World’s End), Richard Ayoade (The Watch), Tracy Morgan (30 Rock), and Simon Pegg (Shaun of the Dead). The Blu-ray™ Combo Pack and Blu-ray™ 3D Combo Pack include a Blu-ray™, DVD and Digital HD with UltraViolet™. VOICING THE BOXTROLLS — The tremendously talented cast members of The Boxtrolls discuss what it’s like to voice an animated puppet, what each actor brought to his/her role, whether their personalities were similar to their characters, and more. INSIDE THE BOX — The directors, producers, and creative supervisor of character fabrication Georgina Hayns share the challenges of crafting characters who are inside a box. THE BIG CHEESE: ALLERGY SNATCHER — The directors and producers are joined by Brian McLean, director of Rapid Prototyping, to discuss how the animation studio LAIKA creates the faces for their puppets. The big story here – literally! – is how Snatcher’s face changes shape due to his cheese allergy. DECONSTRUCTING THE DANCE — Discover how LAIKA combined traditional stop-motion animation with visual effects in order to create the beautiful ballroom dance sequence – and how costume designer Deborah Cook met the challenge of creating costumes that could flow during a dance scene. THINK BIG: THE MECHA DRILL — Standing 5 feet tall and weighing over 75 pounds, the Mecha-Drill is the largest stop motion puppet/prop ever created by LAIKA. Follow its creation from design to completion. and lastly, the FEATURE COMMENTARY WITH DIRECTORS ANTHONY STACCHI AND GRAHAM ANNABLE! 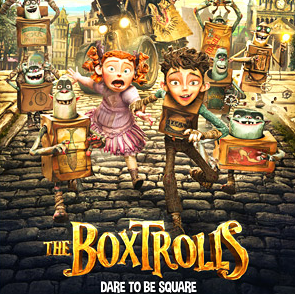 Check out The Boxtrolls trailer below!